UPDATE: You can get a 5% discount off your order for the Sea Frogs Salted Line housing and accessories by putting the code: LSP in the discount box on the checkout page. You pay less, and I get a small commission which goes towards running this site. Summary: The Sea Frogs Salted Line a6xxx series is a versatile water housing that has all the features surf photographers need, and some they don’t. Buy it now if you want to take dive and surf photos. I’m slowly building out the list of supported ports and lenses for this housing, so if there’s a specific lens you want to know about leave a comment below or email me on ben@learningsurfphotography.com and I’ll do my best to find out for you. There are at least 4 ports available for the Salted Line a6xxx housing, so there are a lot of lenses that will be supported in some way. Any short fisheye like the Sony 16mm with fisheye adapter, Samyang 8mm f2.8, 7artisans 7.5mm f2.8 or Meike 6.5mm f2 will not work with the current dome port. Sea Frogs have confirmed that they’re working on a smaller dome which will support some or all of these shorter fisheyes and it should be available in March 2018. The smaller macro port can be used with some small prime lenses, it’s a bit longer but narrower than the standard port. It has a 67mm filter thread on the end so you can attach a macro adapter for dive photography. This one was originally designed for the Sony FE 90mm macro lens and can be used on the Sea Frogs A7 series housing too. Sea Frogs list it as a telephoto port for the a6xxx housing and I’ve tried out two lenses in there and confirmed they work for some of their zoom range. I haven’t got the zoom working with either of those lenses, I think it would be possible with the 55-210mm, but the 18-200 would probably be too big to fit a lens gear around. I’ve only taken the housing out once so far. I shot with the Sony 35mm f1.8 lens on my Sony a6000 body and used the pistol grip and the standard flat port. It worked really well, I was able to focus and shoot separately with the two stage pistol grip, I didn’t need to change settings much, but I was able to use the controls easily when necessary. It floats fairly high. They now offer a white version which I’d be tempted to get for a bit of added visibility. I was able to shoot surf photos one handed (I shot some video on my iPhone in an AxisGo in my other hand, it’s at the end of the video above), and didn’t have any issues with how the housing handled in the water. 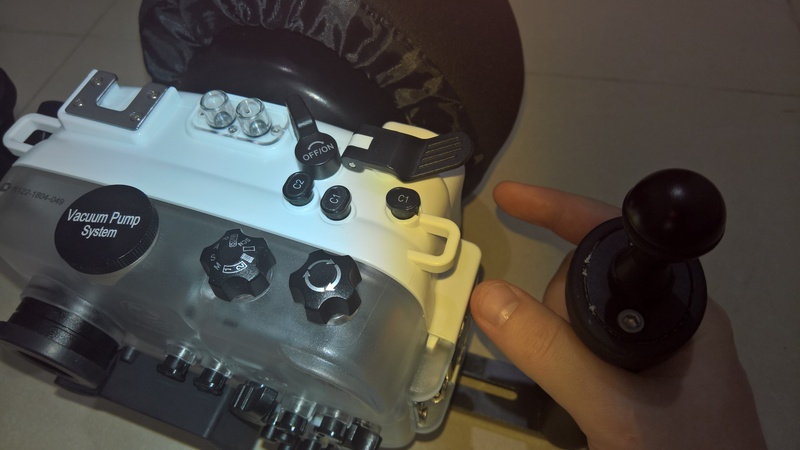 It’s really clear that this is a dive housing which has had some accessories added to make it easier to use on the surface. It’s heavier and bigger than it needs to be for a surf housing because it has extra features and controls and a deeper depth rating than a surf housing. Should you buy the Sea Frogs Salted Line a6xxx series housing? Yes – If you want to go deeper than 5-10m and shoot on the surface too. Yes – If you are on a tight budget and you don’t want to shoot fisheye surf photos. Yes – If you have an a6000 but you are going to be getting an a6300 or a6500 in the near future and need to use the same housing. Maybe – If you want a solid surf water housing, are budget conscious and you don’t travel that much with your kit. If you’re one of the people I’m talking about above – then you won’t be disappointed with this housing. No – If you want a small, surf specific housing with ports and features designed for surf photography. No – If money is no object and you want the best possible surf housing. Everyone will be different. The good news is, there are so many housings available for the Sony a6xxx range of cameras that one of them will be perfect for you. As always another great review thanks Ben. Tried to do a collaboration with Meikon on a pistol grip housing over a year ago. Look like they thought it was a good idea hahaha. Love the Chinese for their integrity and innovation. ;) I have one on order, interested to see how it goes with my Tokina 10-17 and Sigma MC11 paired with the dome. Hope that fits. Wow, it’s a shame the collaboration didn’t work out, I think the grip could only have benefited from your input, you’re setting the benchmark for one handed surf photo control. I think the Tokina + MC11 would be a good fit in the current dome, if you don’t mind the bulk. Not sure there would be a huge benefit over a GoPro Hero 6 + KNEKT KSD6ss + KNEKT GPSS though, I guess bigger raw files and everything that comes with that is the main one, so it’s definitely worth a try. I’d be really interested to hear how it works. Hey ! 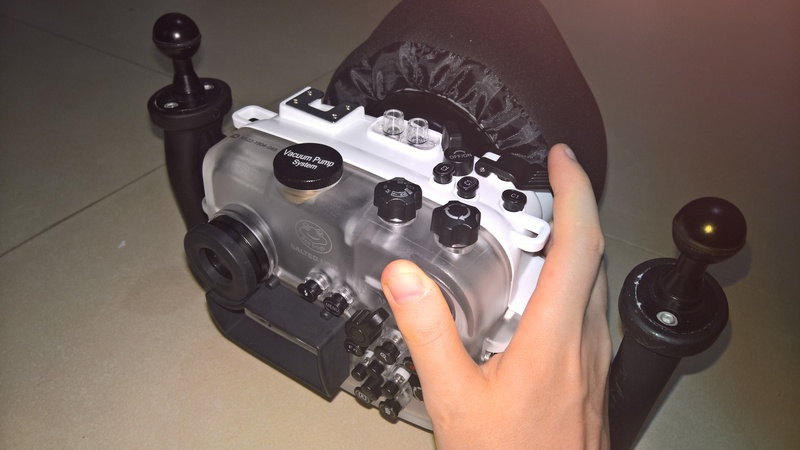 I know the post is old but is there any follow up information about the tokina 10-17 + adapter inside the seafrogs housing (with 6″ or 8″ dome) ? Does it fit & work ? The short answer is: I’m not sure if it will fit in either. If you’ve got the adapter and lens and you can let me know the total length, then I can check the 6″ port for you. The total length of the setup should be 69 mm (lens) + 25 mm (adapter) = 94 mm. Considering that Seafrogs added lenses like the sony 18-105 F4 to there list, which is 110 mm , “fitting” should not be the problem. I was just wondering if it really works ? As a dome produces a “virtual image” I wasn’t sure if the lens can properly focus…. Anyway, what’s the largest possible length that would fit inside the 6″ ? It should work well in the 6″ dome, the length isn’t an issue, and it’s got a really short minimum focus distance, so it shouldn’t have an issue focusing on the virtual image produced by a 6″ dome. 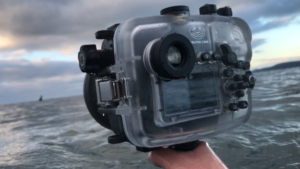 If you’re shooting above water, and using autofocus, you’ll need to watch out in case it focuses on the dome port itself, but it’ll only be an issue if there’s something on the port. I don’t think anything longer than the 18-105mm will fit in the 6″ port. It’s quite hard to measure, and it depends on how wide your lens or lens hood is. I wouldn’t want to shoot surf photos with a telephoto lens in a dome in any case (the 18-105mm would probably be alright at 18mm, but a flat port would be better at longer lengths). I think it’s not mentioned because it’s not a native lens, but there’s no native alternative, so I’m sure there are plenty of UW photographers using it. I used the Tokina on my Canon DSLRs, and loved it, but I don’t miss it now I use the really inexpensive, compact e mount fisheyes. Yeah, a mini dome with no hood would be the killer port for this one. We’ll see what they come up with, it should be available soon at least. The pistol grip gives it a huge advantage over the old housing for surf photography though, and shouldn’t be underestimated. Great article Ben, thanks for doing some solid testing and research. I see you mentioned the Sigma 16mm f1.4 + Sony 10-18mm as good fits for the dome port. Do you think a DSLR fisheye (like the Nikon 16mm or Nikon 10.5mm) with an adapter would be long enough to push the fisheye forward into the port? I think it probably would, I’ve received my Samyang 8mm f3.5 fisheye and it’s just the right length for the dome. I’ll do some measuring to see what the ideal length would be, then it’ll be a case of adding up the lengths of the adapters ad fisheyes to see if it’ll work. I don’t use adapted lenses myself so I can’t test any first hand. Do you know if the zoom is available for the 16-50mm Kit objectiv within the Macro-Port? Do you already have a updated list of lenses for this port? The zoom ring will work OK, but that port will vignette with thw 16-50mm lens at least for the wide part of the range. I’ve tried the smaller port with the 10-18mm lens and it vignettes, even at 18mm. The 16-50mm kit lens (and 10-18mm) will work perfectly with the standard port that’s supplied with the housing, is there a reason you want to use the smaller port? I’ll take some measurements and test the prime lenses I have here with the macro port and add some more detail to the page today. I don’t have a 16-50mm lens available right now, I’ll see if I can get hold of one to do some tests for you. The port is 75mm long from the inside of the front element to the rear of the bayonet mount, and that’s about 23mm from the lens mount on the camera. If you measure your current housing with fixed port, move your camera back a bit to compensate for th shorter port, and do some test shots – you should be able to get a good idea of the focal lengths that will work on your 16-50mm. Can you say me whats the exact length between the glas of the macro-port and the housing of the A6xxx? I can’t get any more accurate than what I’ve posted above very easily. I wouldn’t rely on that if you’re within a few mm, and I’d be interested if anyone else has the housing and port and has tried to measure it up. Did you have the opportunity right now to test the 16-50mm lense? If you’re looking to use the 16-50mm lens with wet lenses, the older fixed-port version of SeaFrogs A6xxxx housing is probably a better fit. I have the last year’s version of SeaFrogs A6xxx with the fixed port, using it with A6300 + 16-50mm + Meikon wet dome, and I haven’t had any issues with the latch. The interchangeable port system is great – in fact, I’m moving to it shortly – but it’s meant to be used in a certain way. The standard flat port that ships with the housing targets surf users rather than dive users; the dome is meant to be used with Sony 10-18mm or Sigma 16mm f/1.4, and the two macro ports target Sony 30mm macro and FE 90mm macro respectively. Most of my shots are CFWA, so I’m moving from 16-50mm in the fixed port to 10-18mm in the dome port, and eventually I’ll probably add the 90mm macro lens with the appropriate port to my kit. Hi Ben, thanks for great review! do you know if the Sony FE 55 mm F1,8 fits inside the standard port sold with the housing? It’s too long for the standard port, it should fit in the smaller macro port, there’s a link to purchase it separately through the Meikon site in the post above. I’d consider getting the Sony E 50mm f1.8 (designed for apsc) or the Sigma 60mm f2.8, they’ll both fit in the standard port and be a bit smaller and lighter too. vignetting from 16mm till 24mm. Only starts to work correctly at 24mm. Nice work, that’s good to know, thanks for sharing. Being on a budget, I was wondering, if there were any additional taxes added to the retail price, the housing being shipped from HongKong. That would from my understanding add another 65€ euros on top (european VAT, with 0% import taxes on camera equipment?)? It definetly will differ from country to country, but If so I might think this would be worth mentioning. I would definitely go to site that can calculate the duty and taxes you might have to pay when ordering from anywhere overseas. It’s something I used to mention in my videos but I forgot about it in this one, thanks for the reminder. I’ve read and watched everything here more times than I care to admit and I finally made the housing purchase. Thank you for taking the time to research all of this and share such a thorough review. 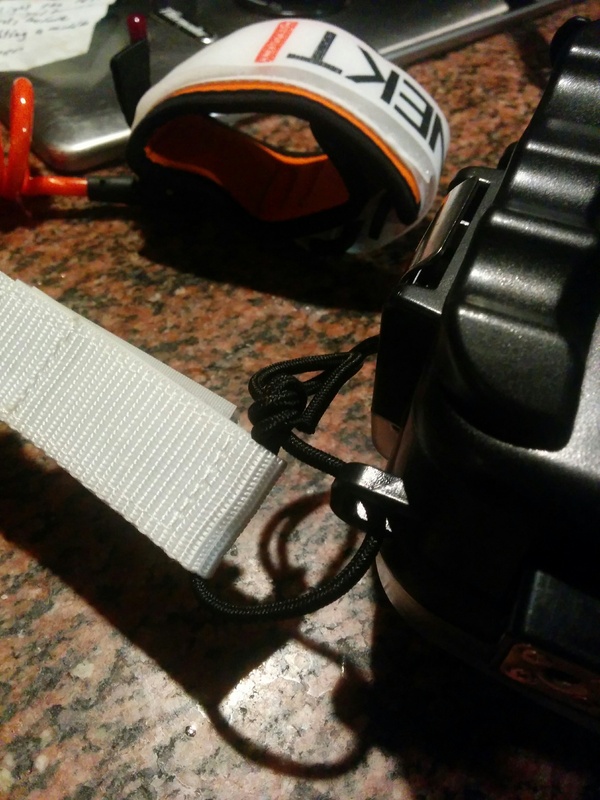 One thing I would love to have your input on is what leash you can/would put on it. There doesn’t seem to be a great place to strap a leash like with an Aquatech housing. In fact I only see four little loops on either side of the camera that may or may not be suitable for tying the leash. I’d appreciate your thoughts! Decent swell in CA this weekend and I’m dying to give it a shot! Thanks, Ben! Hi John, glad it’s been helpful. I forgot all about a leash for my first test shoot, and I grabbed a boot lace as a makeshift one for the second session. I’ll explore the options when I do some more filming next week, I think a short, non stretchy wrist leash is the way to go, there are a few I’ve used, Aquatech and KNEKT both make good ones from memory. Attaching to the bottom of the pistol grip has always worked well for my other housings, but the loops on the housing itself should work fine too. I’ll update when I’ve figured it out, for now, a bodyboard wrist leash would do the job, or a decent string lanyard with some rubber padding if you’ve got one handy. Thank you for the prompt reply! To follow up, I ordered a Knekt bicep tether from their site (http://www.knektusa.com/store/kbt-bicep-tether) and at least in CA it’s on sale (Feb28,18) for $9.99 but you pay shipping in case anyone else is wondering. I’ll be sure to post an update here once I take it out in case others are interested. Thanks again, Ben. Thanks John, I’m sure that’ll do the job. The bicep leashes stay out of the way a bit more, but they have to be longer, so there’s more chance of the housing swinging around if you do let go of it. I’ve only lost grip on a housing once or twice in hundreds of sessions though. You’re pretty well motivated to keep hold of it, and it’s not too slippery, especially with a pistol grip. Ben, I got almost all of the functions to work but I am yet to get the 5 control wheel arrows in a + shape to work (to change ISO or move through the menu). I put in all the a6000 adapter parts and the wheel turning function works. Did you have any issue with this? Any ideas on how to fix this? Thanks for your help and input. Much appreciated! I’m sure that leash will hold, and stay out of the way, but you might prefer a shorter wrist leash just so there’s less slack. I sure it’ll do the job though. I’ve just double checked my housing and the 5 cross shaped buttons all work as expected. Maybe check that the insert is aligned properly, mine clips in quite securely when it’s in the right place. Then I’d check if the camera is aligned in the housing. I can’t imagine what else would cause that issue. do you know if any of the ports will work (well) with the Sony FE 55mm f1.8 or FE 85mm f1.8? I have a liquideye right now for a6000. but this looks like maybe a better option for my needs since it supports the 10-18mm, and has flash cable outputs. Not to mention tool-less entry, and ability to upgrade to a6300 or a6500. I’d rather not buy the E 50mm 1.8 if the FE 55mm is an option. But it might have too large a diameter. But I can’t be 100% sure on either, I don’t have them myself. My 2 cents words, 10-18 is not a really interesting focal range to shoot in the water. According to my experience, people who own the Tokina 10-17 (which is a quite similar focal range) rarely use this lens at 17mm but only as a fixed lens at 10mm. I guess you will do the same with the 10-18. Tool-less entry is another point but do not forget the latches on the Seafrogs are from NRH (a Shanghai based company) and they are not secured as the ones from Nielsen Session as on Aquatech models. So it means they can accidentally open if they get hooked by something like a leash for example. We have been reported even the Nielsen secured latches got those issues every now and then. And if this happen, you can say good bye to your precious gear. What are the alternatives to 10-18mm though, if you’re looking for a rectilinear ultrawide on APS-C E-mount? 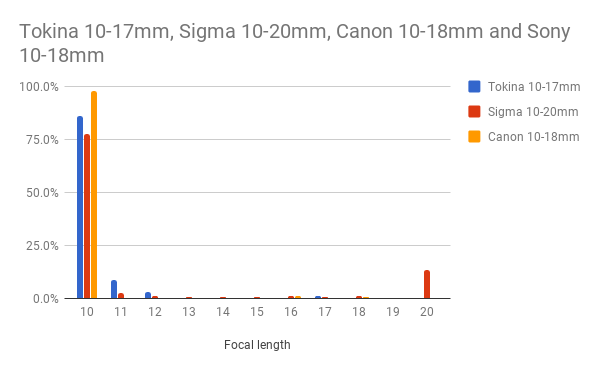 Zeiss 12mm is not as wide, not compatible with PDAF, and I’ve read it has issues fitting into ports with its flared end, Rokinon/Samyang 12mm is manual-focus only, and 16mm with ultrawide adapter has, by many accounts, significant IQ issues. There is the excellent FE 12-24mm, but it’s big, heavy, costs $1600, and isn’t as wide as the 10-18mm on APS-C – its full-frame coverage is wasted on a crop sensor. I can’t speak for Philippe, but personally I prefer the fisheye look, so I haven’t shot with an ultrawide rectilinear for a long time. I can de-fish the 7artisans 7.5mm fairly easily if I need to. If there’s enough light for f8, the Rokinon/Samyang 12mm will have enough depth of field to get everything beyond 50cm in focus I expect. The newly announced Laowa 9mm f2.8 Zero-D could be an option if you need rectilinear, but I imagine it’ll be pricey. I suppose this will work on the surface, but coming from a diver’s perspective, 50cm is often the outer edge of what’s usable – water (and stuff in it) simply absorbs way too much light. Laowa 9mm looks interesting, but again, manual-only, so not very useful underwater. Fair enough, I don’t take dive photos, I’m sure the challenges are very different. I’m definitely someone who just uses the widest end of a wide angle zoom for my surf photos. I haven’t used the Sony 10-18mm in the surf yet, but I guess it’ll be similar. im just starting out with surf photography and i shoot mainly portraits. do you think i should buy this housing or save up and get a liquid eye waterhousing instead? What would you say is the sharpest lens to use with the housing? 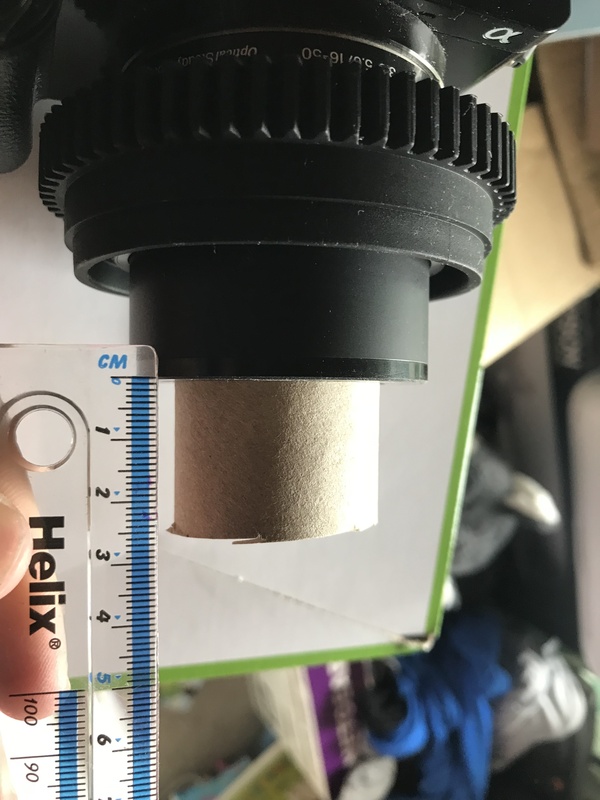 Sigma 16mm with dome port? Does the Sigma 60mm go OK in there too? I see you have listed it. Also what would you recommend as the sharpest fisheye? Both the Sigma 16mm and the Sigma 60mm are very sharp, but for my purposes any of the decent primes are more than sharp enough. I’d think about the focal length you want rather than sharpness. A 35mm might be a better option than 16mm or 60mm even if it’s not quite as sharp (the Sony 35mm f1.8 is one of my favourites). All the fisheyes I’ve used are very sharp in the centre when stopped down. Pick the one that fits inside your port. Currently I use the Meike 6.5mm circular fisheye and de-fish if necessary. I’ve got a panoramic print about 25 inches across on my wall from the a6000 and Meike 6.5mm (the circular image is cropped to a rectangle) and it looks great. I’ve also got some sharp shots from the kit lens in a housing, but the focus isn’t as consistent as with a prime lens. Hi Ben can I use the sigma 60mm with the port that is shipped with the case? Or I have to buy another port? The Sigma 60mm f2.8 fits in the standard port that comes with the housing. The 16-50mm also fits and there’s a zoom gear for it so you can control the zoom when it’s in the housing too. Hi Ben, do you know if the Sony 50mm f1.8 will fit into the macro port withou vignetting? I tried it out quickly and it should be fine with no (or very little, I didn’t look at the files on my computer) vignetting in the short macro port. It also works perfectly in the standard port. what would you say about the Samyang 8mm f/3.5 UMC Fish-eye which also fits in this housing? The image quality is good, and it works well in the dome port, so if you want a fisheye it’s a good option. In that case it’s probably the only native e mount fisheye that will fit. If you want to shoot fisheye it’ll work well, it’s just bigger than the other options. Hi Daniel, I don’t think the link you posted is working, it might just be my phone. Could you let me know the product name of the new port and I’ll check it out. Thanks. The last port (Macro port for A6xxx Salted Line) is the port I asked for. The port can only be preordered at the moment. Thanks, I can see the port you mean, I’ll see if I can get hold of one once they are available. I don’t have the Sony 30mm macro lens, but I’ve got the other two. I’ll see if I can find a deal in the macro lens at some point. I have a question about whether the standard flat port would accommodate the 16-50mm kit lens along with both Meika extension tubes? I don’t think it’ll work in the standard port, the macro port might be ok though as it’s a bit longer. 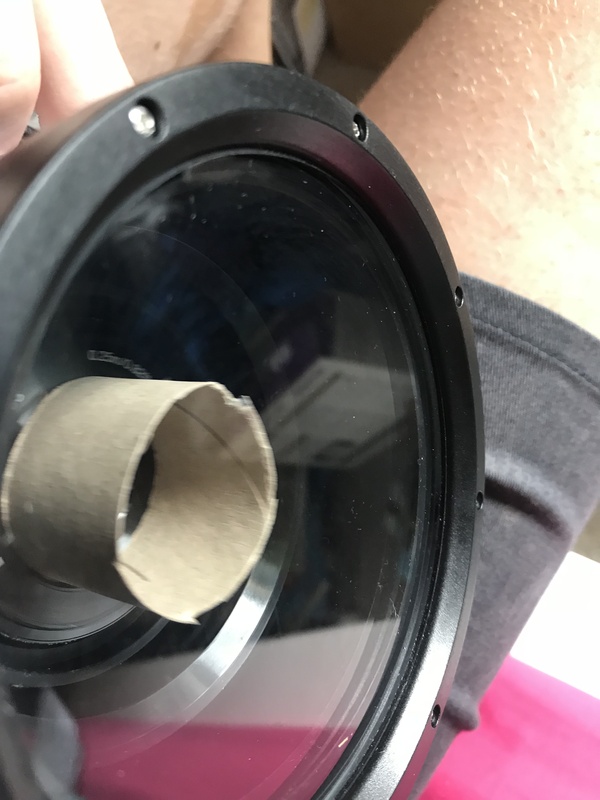 I did a very unscientific experiment with the 16-50mm and a cardboard tube that was about 26mm (I assume that gives you a rough equivalent of the setup you describe). I think the 56mm length is when the lens is unextended, as soon as you turn it on it extends quite a lot. I’ll check out what’s happening with the discount code. Hopefully it’s a temporary glitch. Hi Dane, the code is working again now, thanks for letting me know. I’ve never had any issues with the latches, but I guess it’s possible that they could get caught if you’re really unlucky. I wouldn’t worry about it, tape and stuff would be a pain to sort out every session I reckon. I don’t know for sure, 15 June would be great, but I wouldn’t be surprised if it was a bit later than that. I do know it’s definitely being made right now so it shouldn’t be too long. I’ve actually just got hold of a Sea Frogs ST-100 Pro, but I’ve only used it once. I’ve also never used any SEA & SEA strobes. First impressions are that it works great, although I’m not doing any diving with it, so I’d seek out an opinion from other people. Ok thanks man, sorry one more thing. Hows the quality of those strobe arms and ball clamps? I don’t have much experience with the alternatives, but I’ve got a tray, a couple of arms, a cold-shoe to ball adapter thing and some ball joints and they are all really good. From some research the design is pretty standard, and the quality of materials looks great. I was happily surprised when the fairly large strobe held firmly in place above the housing (I had it mounted to the cold-shoe via a ball joint adapter) even when swimming under and through waves. They’re really easy to adjust quickly too. I would stick with the standard flat port. The dome is good for over under but you really want a wider lens (like a fisheye or the 10-18mm) to get the best split shots. For the lenses you have I’d go for a flat port every time. thanks for quick reply Do you have any experience with the sigma 16mm 1.4? I’ve used it once so far. I used it on an a6500 in the Sea Frogs housing with the dome port. It seems like a great lens, if you want that focal length it’ll be a great option. I usually prefer to shoot with a fisheye or a normal length lens, so I haven’t really got anything to compare it to except the kit lens, which I haven’t used that much either. I’ll try and use it a bit more, I think it’ll be good for seascape shots at dusk or dawn, allowing for a shallow depth of field whilst still getting the whole scene in. I am wondering of you tried this housing with handles on, is it easy to reach the shutter button ? I am also curious if you’ve tested any of their strobes like the ST-100 Pro in their website. I haven’t tried it with side handles, only with and without the pistol grip. The shutter button is pretty big and very easy to reach when just using the housing on it’s own, so I doubt it would be much different with a good set of side handles. I’ve had one shoot with the ST-100 Pro strobe – but I was only using it for surface shooting, so I can’t speak to how well it would work underwater. I’ll probably get to try it out a bit deeper, a few metres max, over the summer, so I’ll add some feedback once I do. It worked perfectly when I used it though. Thanks. I intend to use it for scuba diving to 40m. I need to review the performance and ergonomics of the housing with dual strobe set. I don’t do any diving myself so I wouldn’t know where to look unfortunately. I imagine the ergonomics are very similar to any of the other dive housings that meikon make, so I’d try a more general search to see if you can find anything. Question about ST-100 Pro – how quickly does it actually cycle, at full and half power levels? OK, I’ve tried to figure this out, let me know if there’s a more sensible way to do it. I’m new to strobes. I started a stop watch on my phone, put it in high speed continuous shooting mode, manual focus, held the shutter button down and then worked out the time difference between the two photos based on the stop watch reading. I did a few bursts and it felt pretty consistent. The batteries have been used for a few dozen photos over a couple of sessions, if that makes a difference? Thank you – less than a second at full power is amazingly fast; I believe it’s better than most strobes on the market. I think only Retra strobes with the optional 8-battery compartment cycle faster. If anything, the on-camera flash triggering it will be the limiting factor, not the strobe. This dispels my last remaining doubt about ordering a pair of these rather than going with used Inon Z-240s or Sea & Sea YS-D1s. That makes me think there might be an error in my test somehow. I guess it was ideal conditions, with manual focus and only a few shots fired each time. It definitely seemed pretty rapid though. I was using the a6500 too, with a full battery, if that would affect it. Was the strobe in manual or TTL mode? If it was in TTL, then the camera may have had it firing below full strength, and the EV adjustment by the right-side dial wasn’t enough to get it to a full discharge. I just double checked and it was in manual mode. I actually just tried blazing away in every mode on the strobe with the EV adjustment at both ends of the scale for each mode, and I got about a second each time (I wasn’t timing it this time). There wasn’t a noticeable difference between minimum and maximum power, both recycled in about a second. I think the on camera flash is the limiting factor as you said. I can’t find any figures anywhere else on line, only one site mentions recycle speed and it just says “nearly instant” – which is pretty meaningless. At least with my tray, the shutter button is not reachable while holding the right handle. However, unlike, say, Ikelite housings, this one easily fits into the hand – you don’t need the handle to hold it. thanks a lot for sharing your experience and pics. Thanks for the reply! great to get some first hand experience. 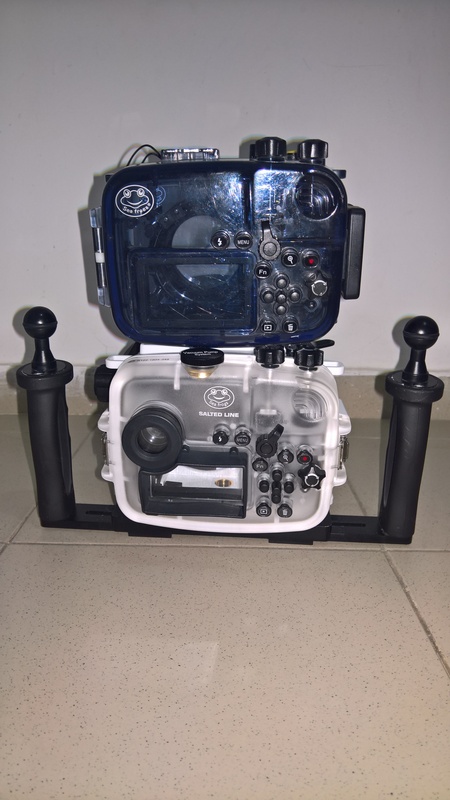 Hi Ben, I’m interested in buying this underwater case for my a6000, I use it for underwater photography only. Can you tell me the distance between the two 1/4 screw holes on the bottom of the case? There is only two right? Thanks, Daniel Silva . I’m also very interested in some underwater reviews of the seafrogs st100-pro flash, it looks like a good alternative to the sea and sea flashes but I’m a bit concerned about flooding issues at greater dephts . Anyone with more details about the flash? There are only two 1/4″ screw holes on the bottom and they are approximately 8cm apart, measured from the centre of each hole. I don’t know of any reviews of the ST100-Pro flash, I’ve got one, but only used it once, and only on the surface. Everything feels really solid but I’m not familiar with deep diving so I’m not sure what I’m looking for really. If I find any reviews or feedback on the housing and flash from divers I’ll let you know. Hi Ben, thank you very much for your reply! That’s been very helpful, I need to see if my underwater tray will fit with the new case… By the way can you tell me what is the measure of the case, from side to side? I want to know if i have enough space between the handles in my underwater tray. Any idea whats going on there, surely this port is more prone to damage. Any updates on how you getting on with the strobes? 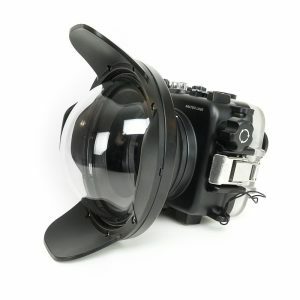 The 4″ dome is designed primarily for surface work like surf photography as far as I know. In that situation a hood actually gets in the way and can push water around that gets in your shot. 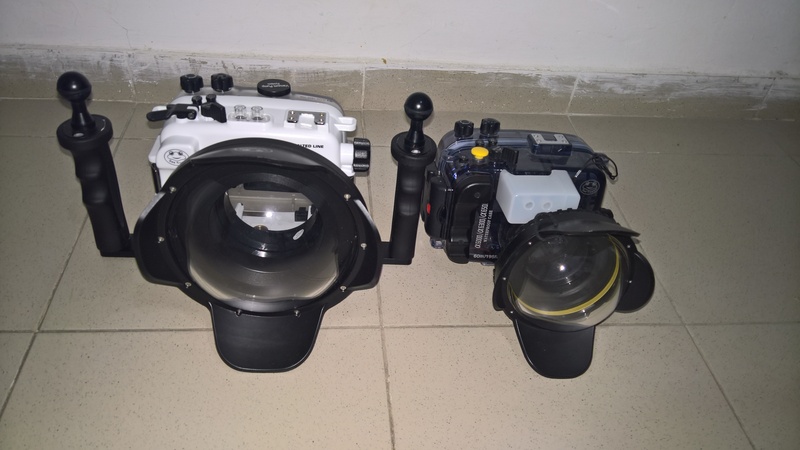 If you look at dome ports for surf housings from any of the established brands (Aquatech, Liquid Eye, SPL, Salty surf housings, CMT etc.) none of them have a lens hood. I’ve had a couple of scratches on my dome ports in the past, but a hood probably wouldn’t have helped much. I did a quick shoot a couple of days ago with the Sony 30mm macro lens and the strobe. I need a lot more practice with the setup to get consistent results, but I was happy with the way it worked. The controls are pretty good, the strobe and arms feel really solid. 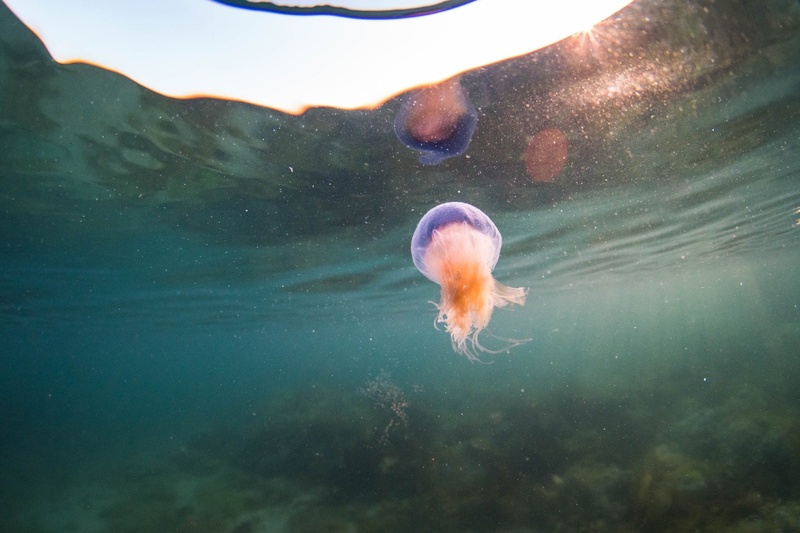 If I ever use it underwater enough to get proficient I’ll report back, but it’s quite a learning curve and I don’t get to shoot on flat days too often. Does the salted line a6xxx water housing dry dome port accommodate the sam yang 8mm lens? 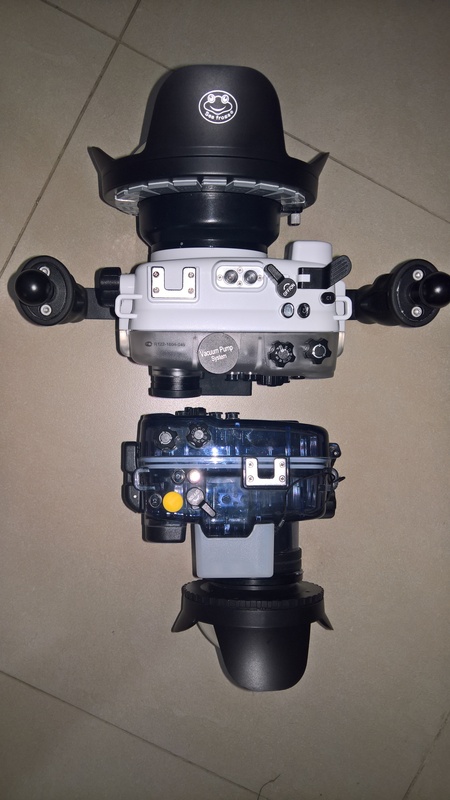 There are a couple of dome ports and a few samyang 8mm lenses, so it depends on your combination. So make sure you get the right lens/port combo and you’ll be fine. For what it’s worth, I got the small dome and tested the 7Artisans 7.5mm f/2.8 lens in it – the lens fits and I’m able to control focus using the 16-50mm lens gear and some double-sided tape, but there is some corner vignetting; I suppose 192 degree FoV is just too wide. Samyang 8mm f/2.8 should be fine. I tried it out with the 7artisans 7.5mm too and had the same experience with minor vignetting. Great idea with the zoom gear, I’ll try that next time for sure. Here’s a shot from the 7artisans with corners cropped off. Hey Ben, great videos mate, I use a Nex 5T for surf shots currently but also own an a6000, thinking about getting the salted line housing. I don’t travel far from Cornwall often so think it might be a good way to go! What shipping method do you suggest when purchasing and do you get import charges for the housing? Thanks Danny, it sounds like it could be a good option for your a6000. Shipping wise I think the standard option is pretty reliable, but obviously takes longer than UPS, the packaging on mine was good, so I doubt you’d have any issues. If you need it quick I’d pay the extra. The tax and duty are estimated on the shipping page and depends on what you’re ordering. I’d always expect to pay them on delivery (for me it means a trip to the local Royal Mail depot to pay and collect), but it’s possible to get lucky on some shipments. Hey Ben, I’ve picked up the original black a6000 housing by meikon cheap on ebay. It’s watertight after a few tests, needs a good clean though, do you suggest any brands of silicone grease? or should I be trying to get hold of meikon grease? Does it matter too much which one to use? I just use whatever I find first, so I’ve used the stuff I got with Meikon, Aquatech and Canon housings on all the different brands in the past. I wouldn’t worry about it. Small tubes and pots are easy to find on line if you search for ‘silicone grease diving’ or something similar, otherwise you’ll end up with a lot of car products and industrial sized tubs. Or just pop in to a local dive shop, they’ll have some for sure. I might be wrong and it could be very important to get exactly the right stuff, but I’ve never had any issues with using whatever I have handy. have you tested the Samyang/Rokinon 12mm in one of the 4″, 6″ or 8″ Dome Ports? I replied on the other post’s comments, basically it should fit but with no focus control. You might be better off using the standard flat port with it, if it doesn’t vignette. Hi Ben, thanks for your answer. I’ve tested it in the standard flat port and there is no vignetting. But I think for underwater photgarphy, a dome port is better.